June | 2013 | What Can I Say ? 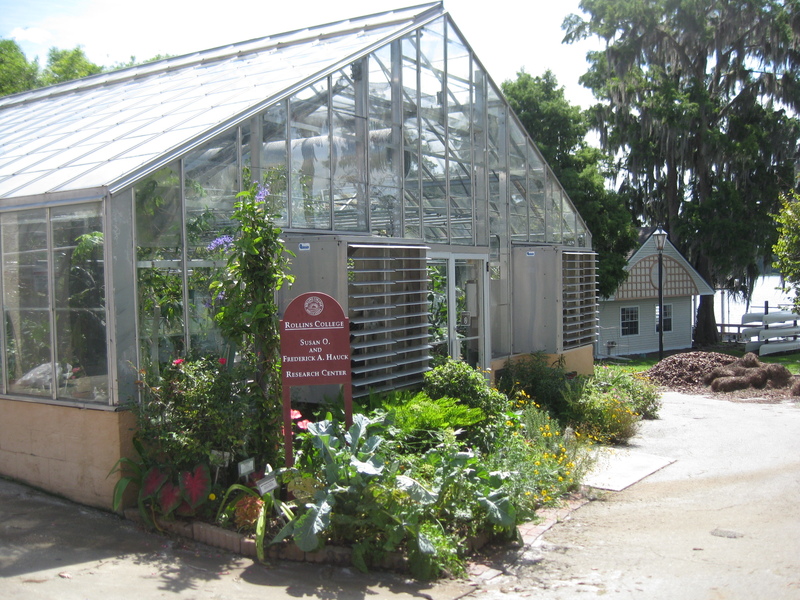 Today after breakfast at the new branch of First Watch on Aloma Avenue, we went with our buddies Alan and Mark to visit the greenhouse at Rollins College; it was a nice antidote to all the yelling I’ve been doing this week thanks to the imminent destruction of the pioneer Capen House. Alan is the greenhouse manager, and this morning he gave us a tour. 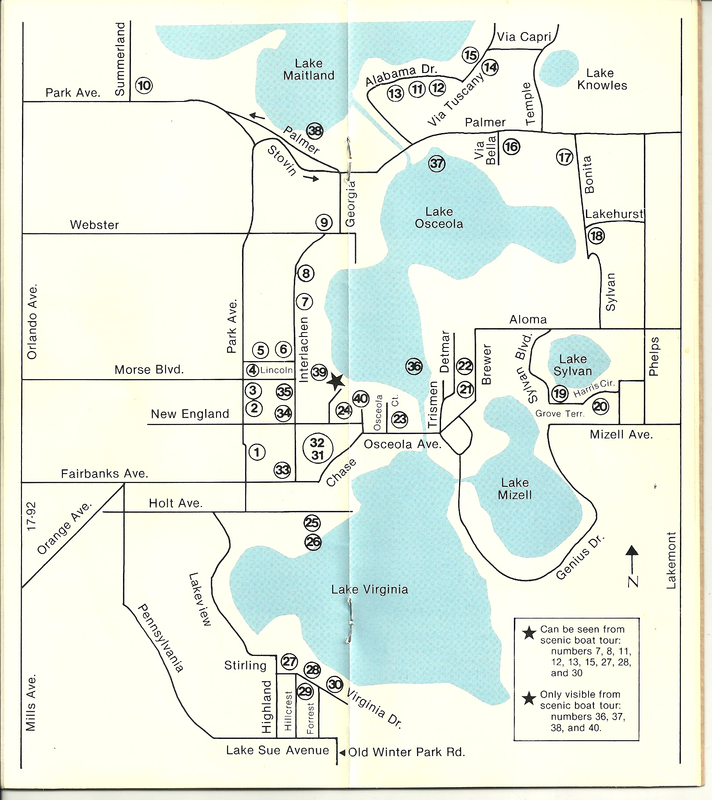 According to the Rollins website, The Susan O. and Frederick A. Hauck Botanical Research Center, or what is commonly referred to as “The Greenhouse,” is conveniently located next to the Alfond Boathouse on the shores of beautiful Lake Virginia. 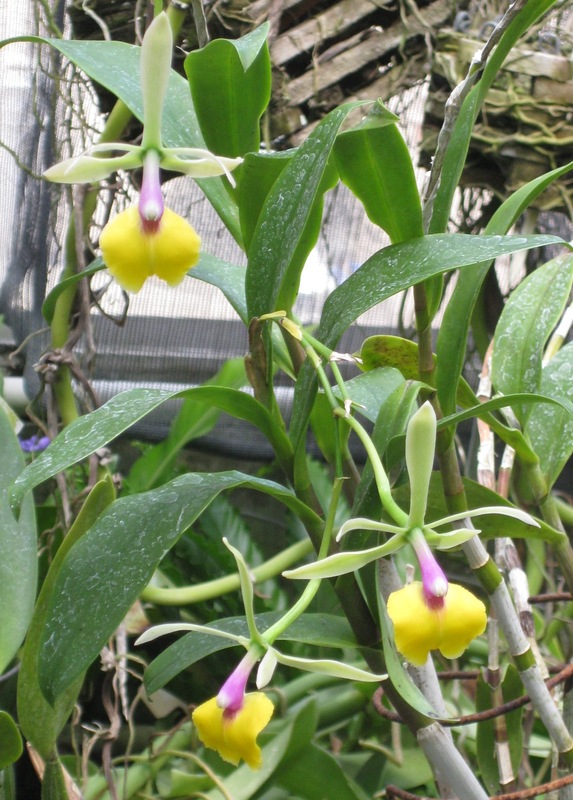 The Greenhouse opened on October 20, 1983, to facilitate student and faculty research, provide plant material for study and to permanently house a diverse collection of plant species, some of which are indigenous to Florida. During the Summer of 1998, a student designed and installed a butterfly garden. A book which describes each plant in the butterfly garden in detail is available to the public as a reference during normal hours. It was very warm inside, what with all this weather we’ve been having, but I managed to photograph some of the inmates before the camera’s lens fogged over. 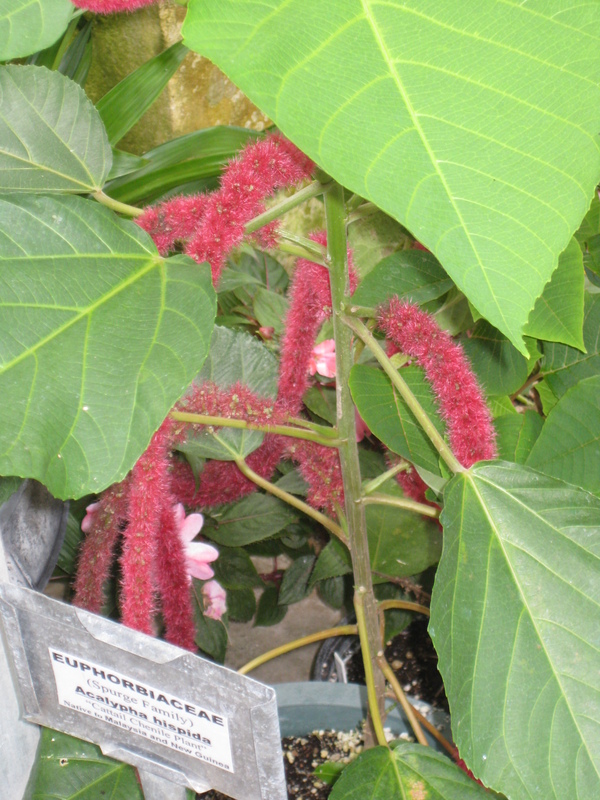 This is a chenille plant, though I first knew it as “Love Lies Bleeding” when I planted seeds years ago. “Love Lies Bleeding” sounds like the name of one of those bodice-ripper romance novels featuring Fabio on the cover. I’d ask to live in here if it was air-conditioned, but then I would survive and most of the plants wouldn’t. Besides, there might be bugs. I can imagine waking up at night and, in a panic, breaking through the glass panes because I discovered that I was covered with ants. 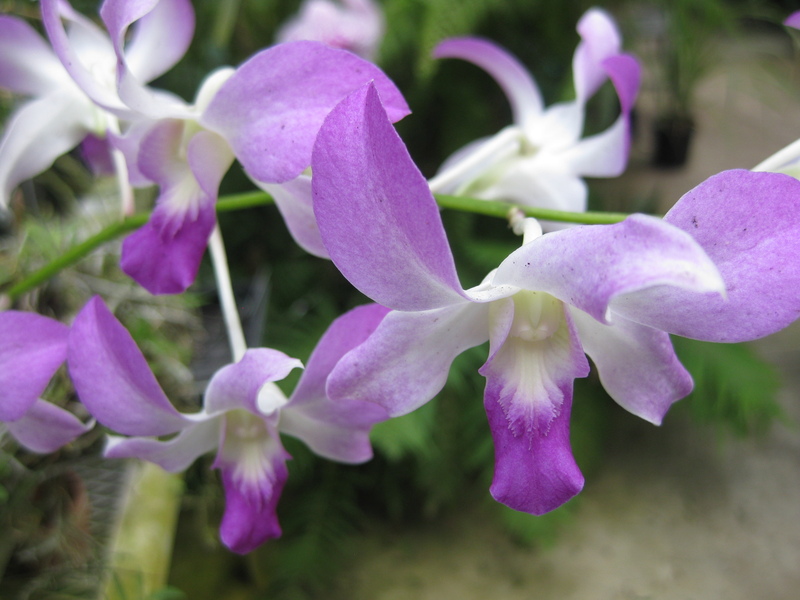 It’s very nice inside, steamy and tropical and there are hundreds and hundreds of unusual plants growing and blooming. 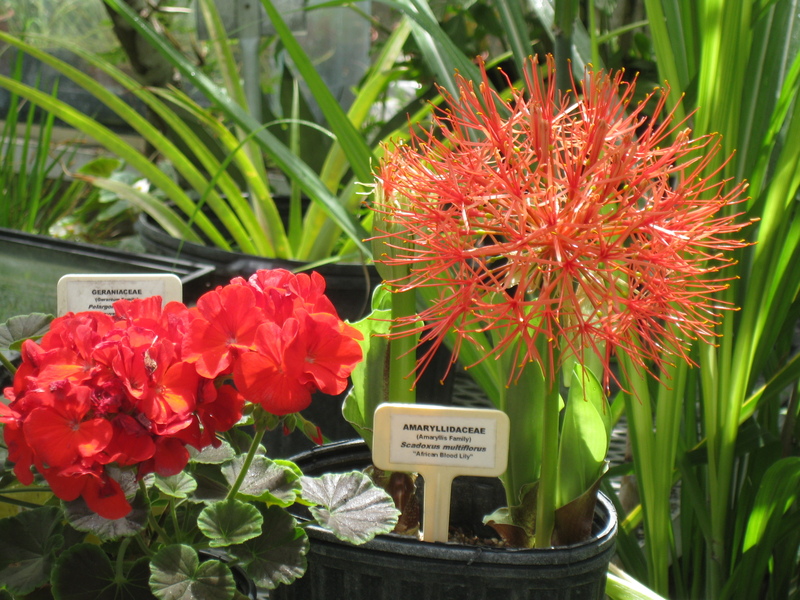 A geranium and a blood lily. 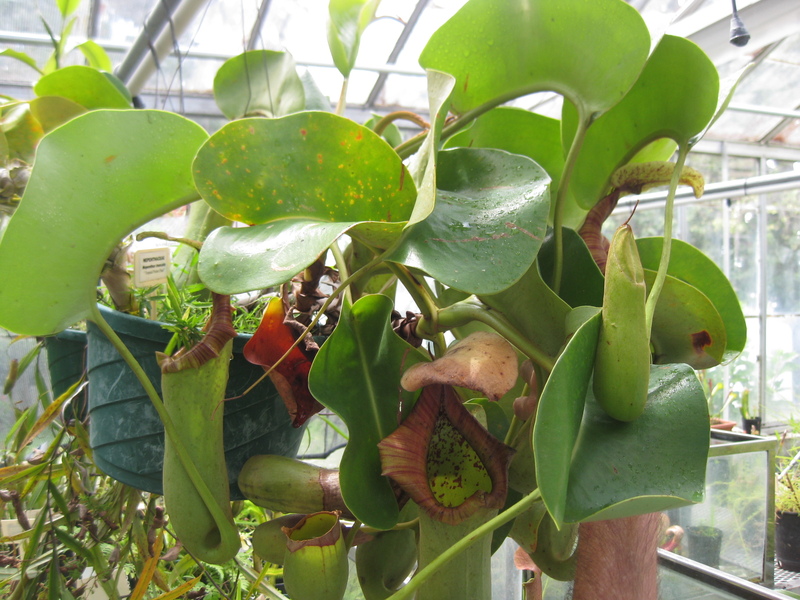 Pitcher plants. These things are big, over six inches long in some cases, and have been known to entice and digest things like mice. 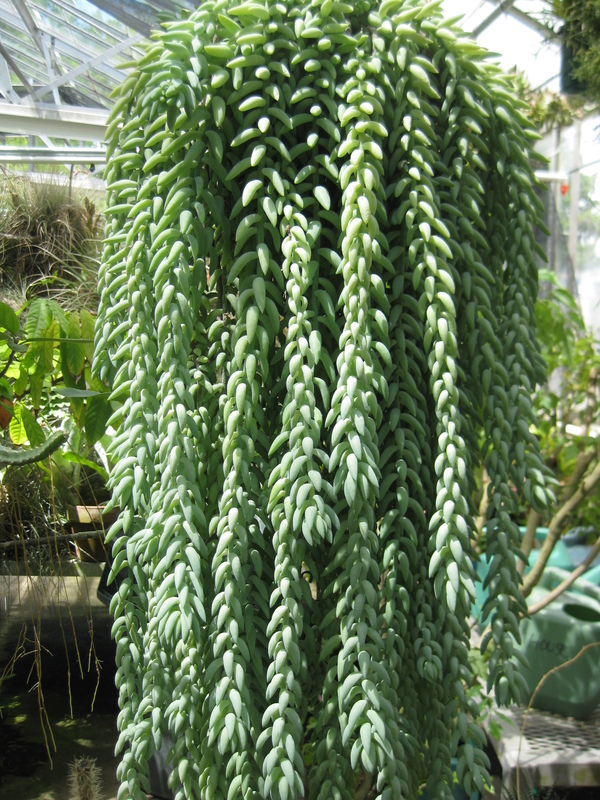 Ropy donkey tail, a sedum. 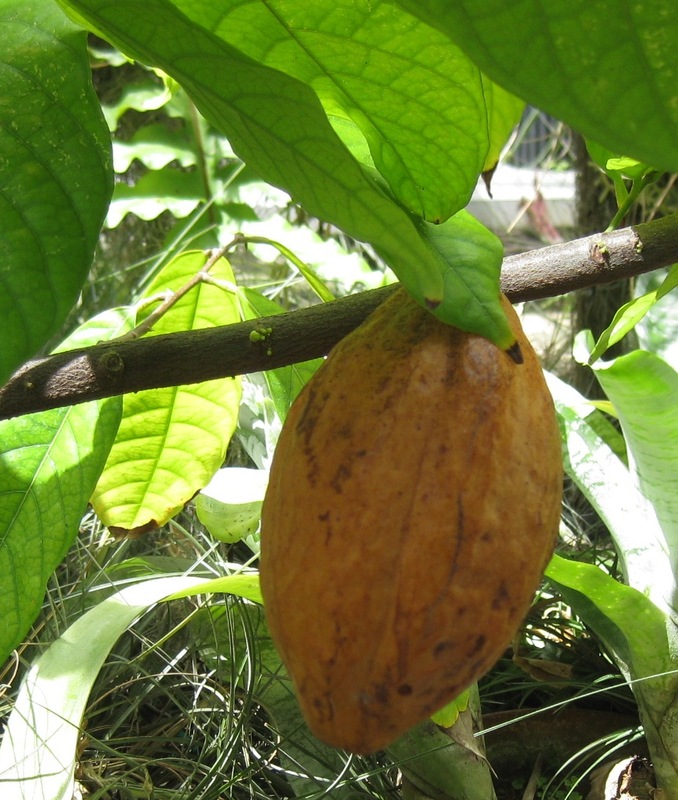 A nut from a cacao tree. Inside there is Swiss chocolate! I also took some video of Alan demonstrating how the Venus Fly Traps work, but they are .avi files and won’t upload on WordPress unless I buy an upgrade. And there’s so much to see on the college grounds. Pinehurst Cottage, erected in 1886, is a showplace. 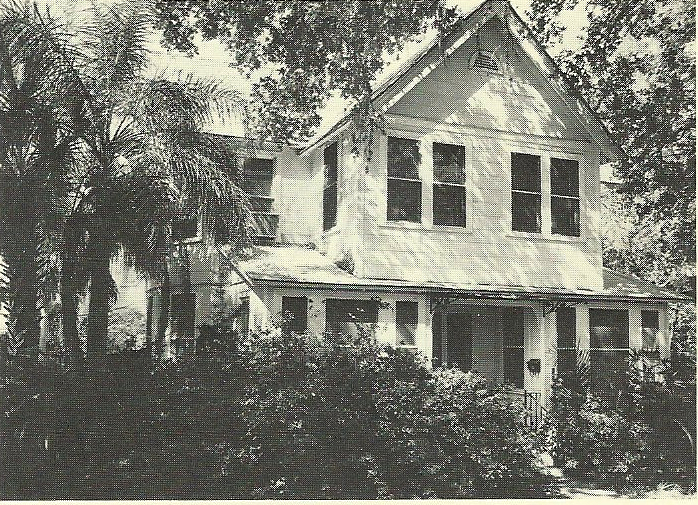 It was one of the school’s original two buildings. It’s a beautiful spot for a school, nestled along Lake Virginia. It deserves a trip back, by bicycle. 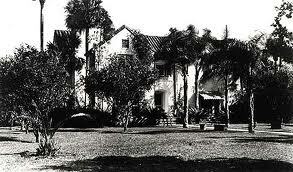 The Capen House, Winter Park, Florida. Photo by George Skene of The Orlando Sentinel. The world is a volatile place: turn on NPR on the way to work and you might find yourself in a righteous rage by the time you set foot in the office. The human species, in reaction, tries to create places of refuge which will enable us to isolate ourselves from the outside fray, even if for just a few hours. Winter Park is one of those places. 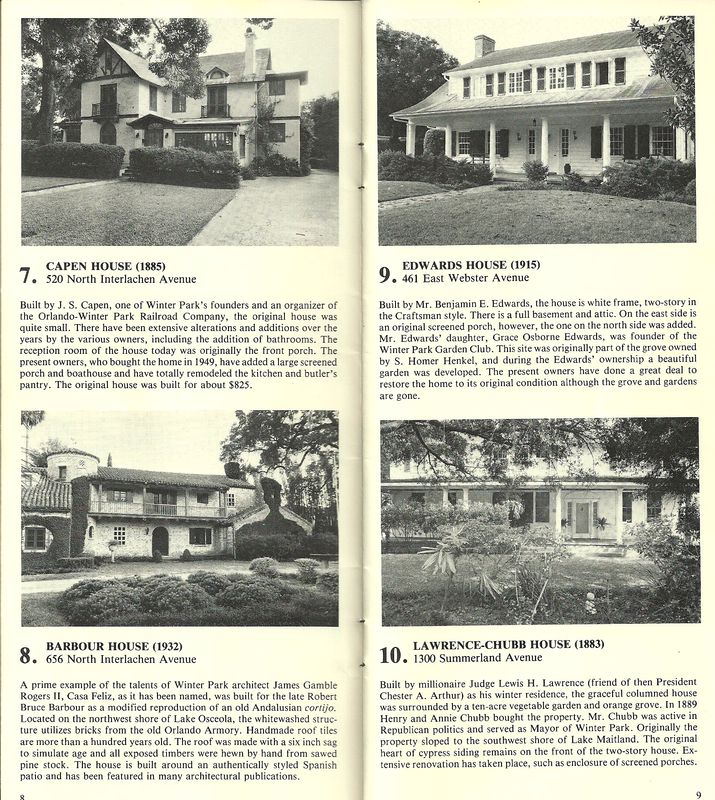 Planned as a leafy retreat from cold, northern winters in the 19th. century, it’s always held a special cachet in the hearts of people who dream about living as ideally as possible. Though we all know that bad things lurk behind the front doors of our homes, and perfection is impossible, we still strive for utopia and we build with that in mind. On so many levels, our homes reflect the people we wish to be. 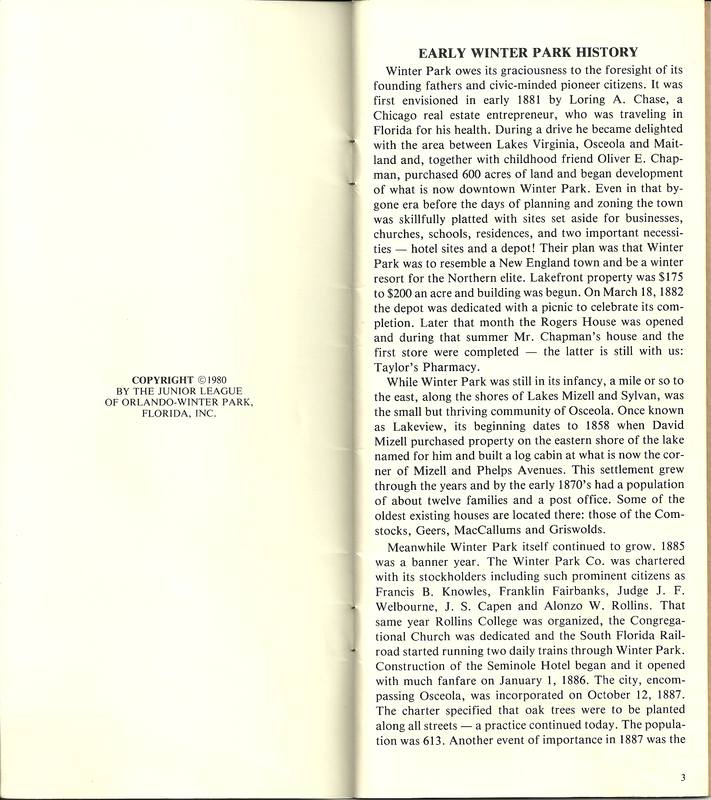 Winter Park was lucky in that its original settlers and earliest families built homes that truly reflected their idea of living beautifully. They decorated the landscape with representations of architecture from various periods, some practical, some fanciful, but so many of them memorable. 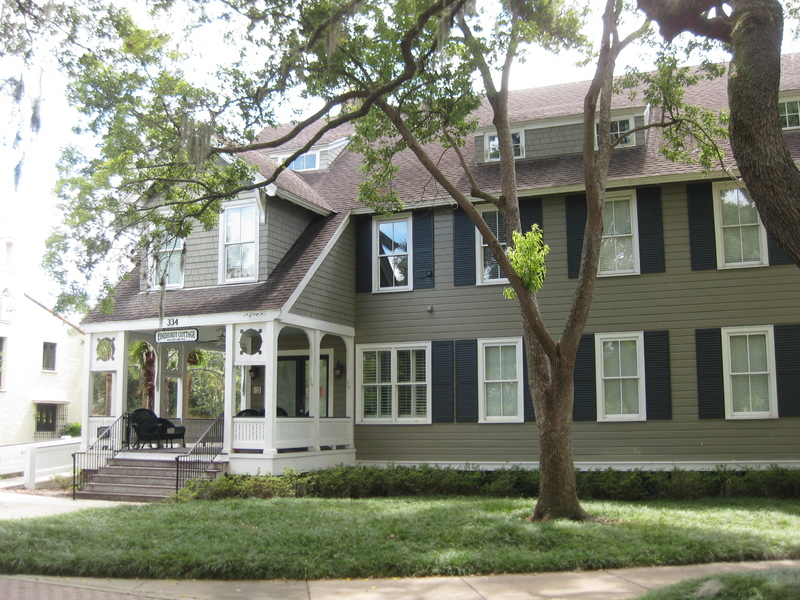 Annie Russell house in Winter Park. Gone. 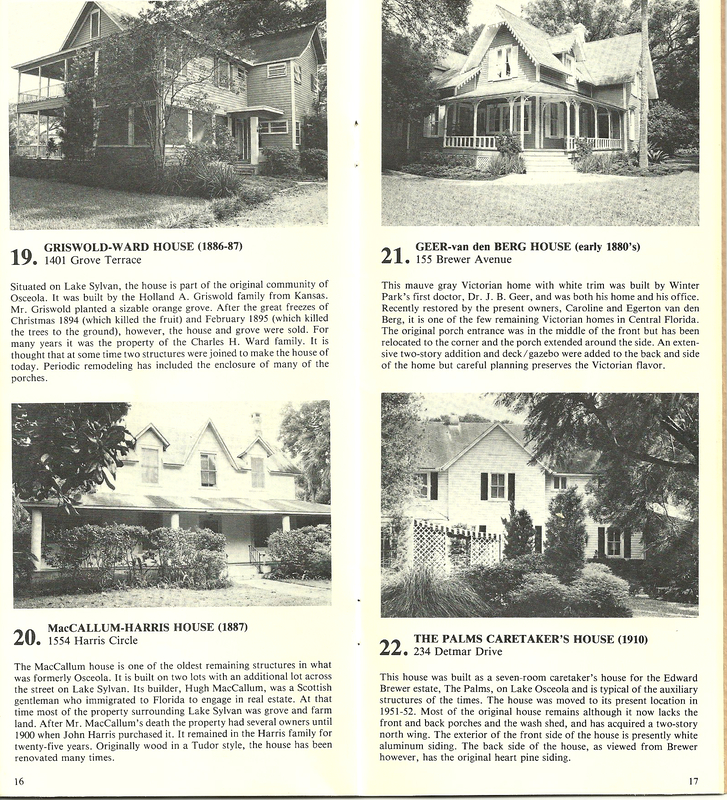 I realize that, with no historic district in place, a house can still be marked notable… and still liable to being razed. I realize that people can do what they want with their property, and can build what they want, and can tear down what they don’t like. 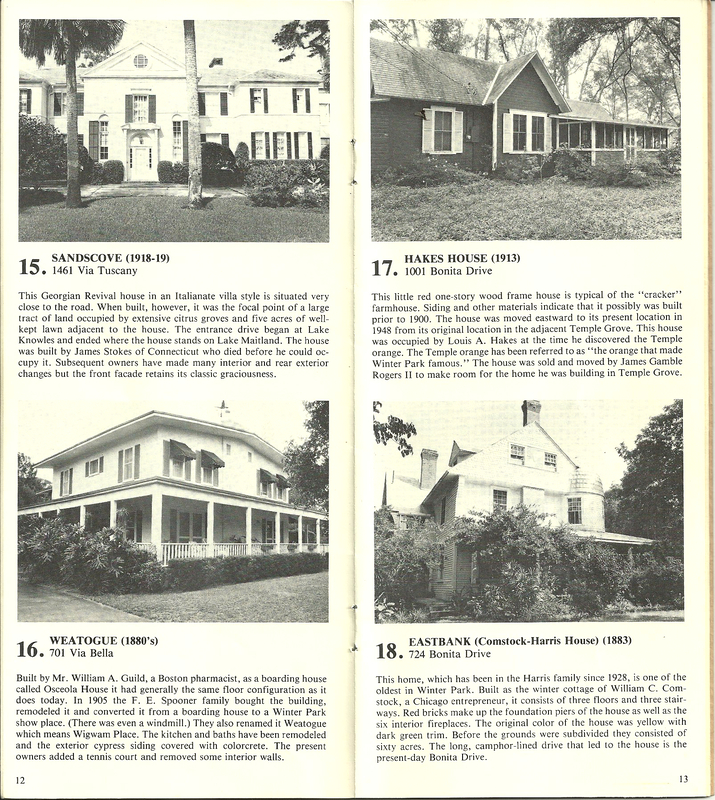 This is America and, when a house is not on a protected list, it goes extinct. What I don’t understand is why people would move to a town because of its historic charm, and then proceed to obliterate one of the things that drew them to that town in the first place. It’s almost sacrilegious. Sometimes, good things happen. 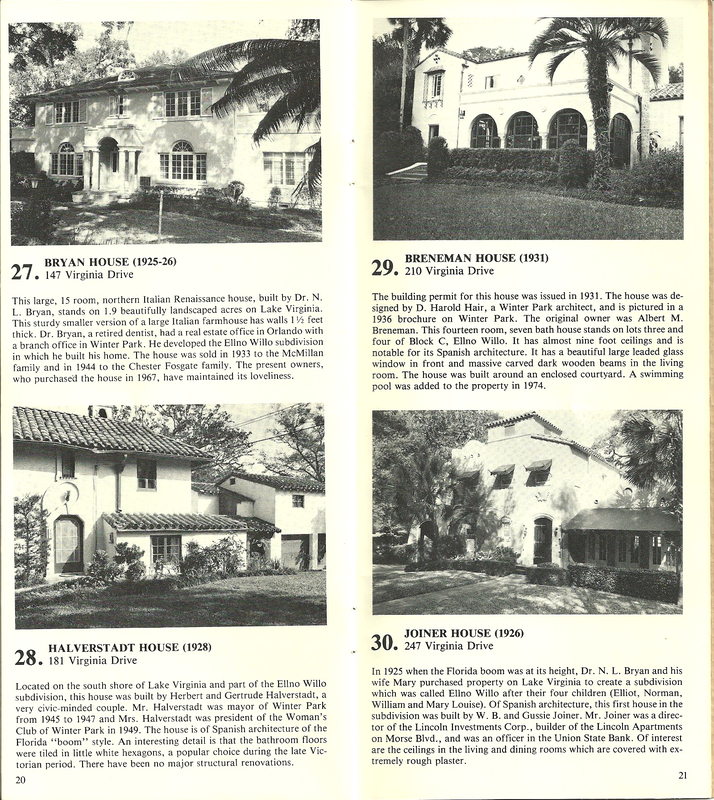 Remember Casa Feliz, the beautiful home in Winter Park that was purchased and then threatened with demolition by its new owner? He was going to build a new house on the lot; apparently, the last I heard, he never did. 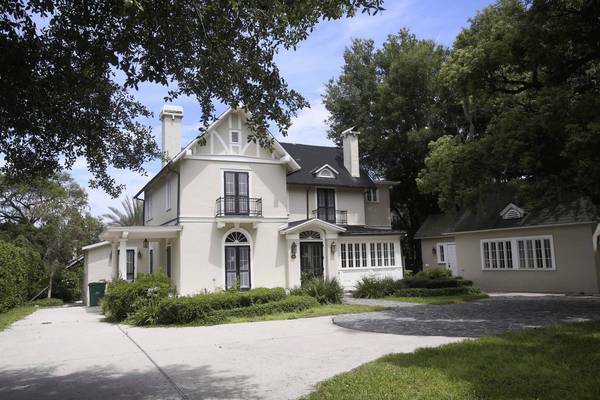 The community got angry, however, and pitched in to have Casa Feliz moved slightly west, on the golf course… and it’s now a valuable, cherished part of Winter Park. It’s a piece of the past functioning as a vital part of the present- ergo, the future. 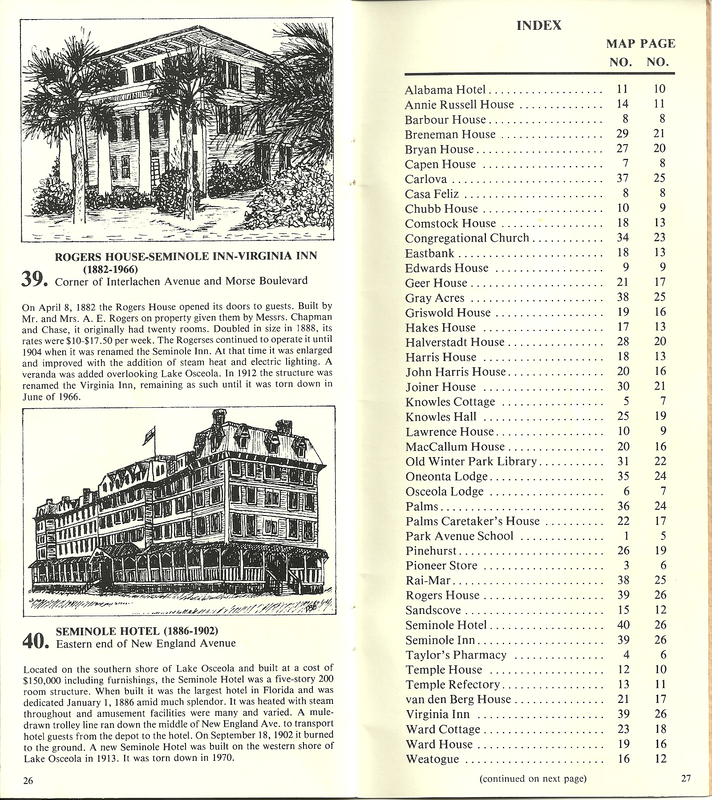 Oneonta Lodge, Winter Park. Gone. 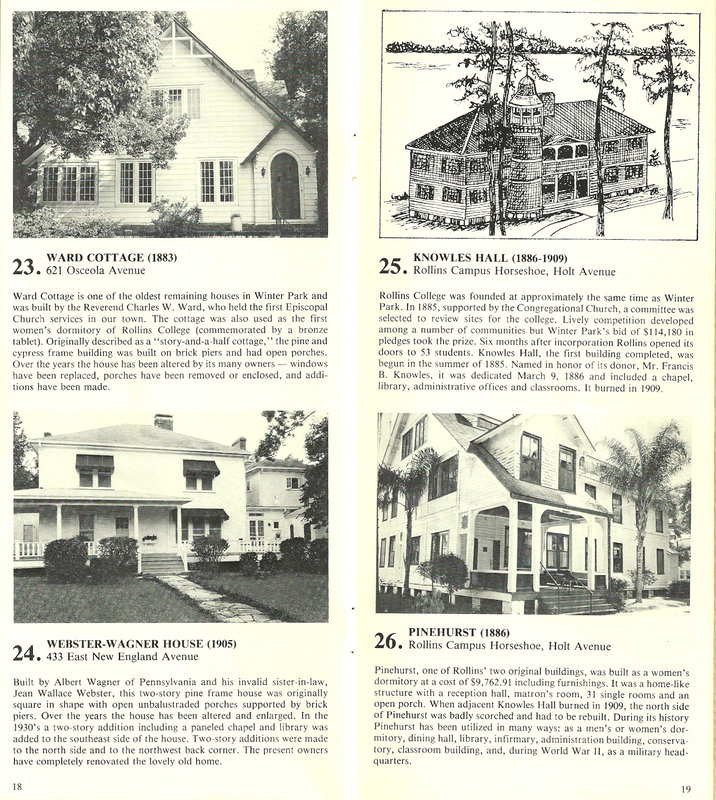 I work in historic preservation out in west Orange County. My office is in a railroad shed that was built in about 1915, and what we do is collect family history, documents, photographs, and the like. 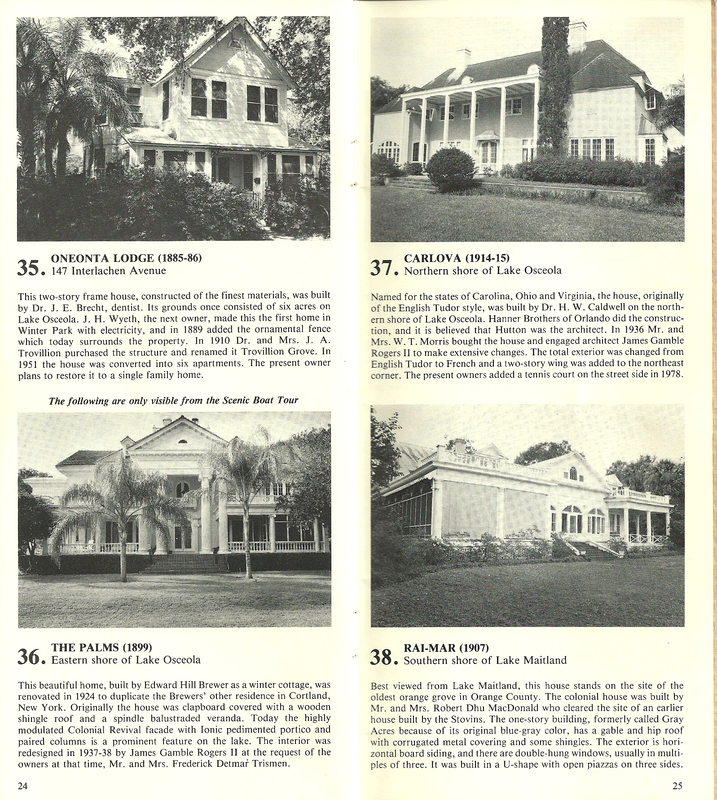 We are well past halfway in our capital campaign to have a NEW preservation facility built; however, the old building will remain part of an expanded Central Florida Railroad Museum. 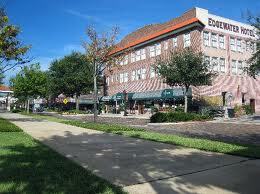 The Edgewater Hotel. 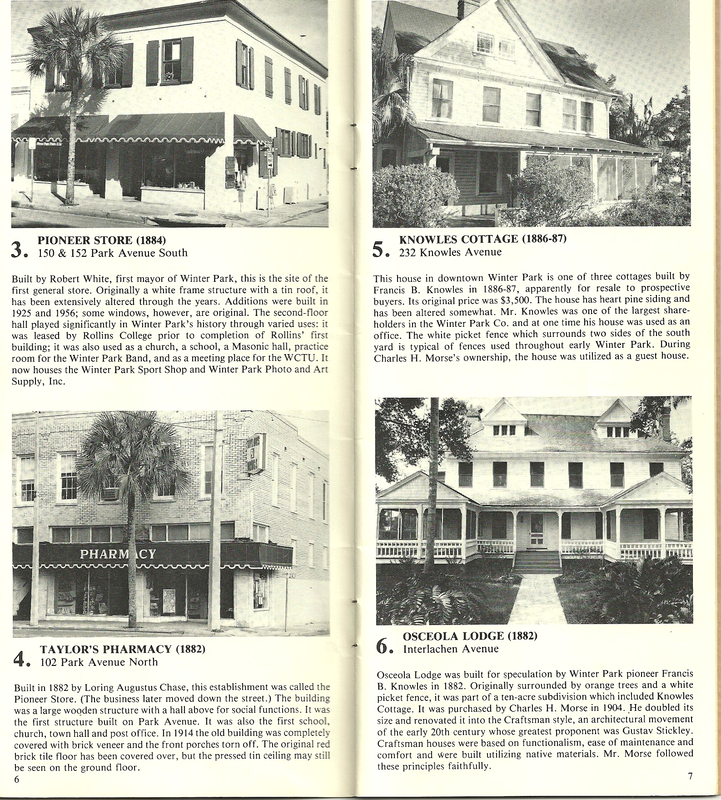 Three restaurants, shops… and history. That’s the way they do things in Winter Garden. 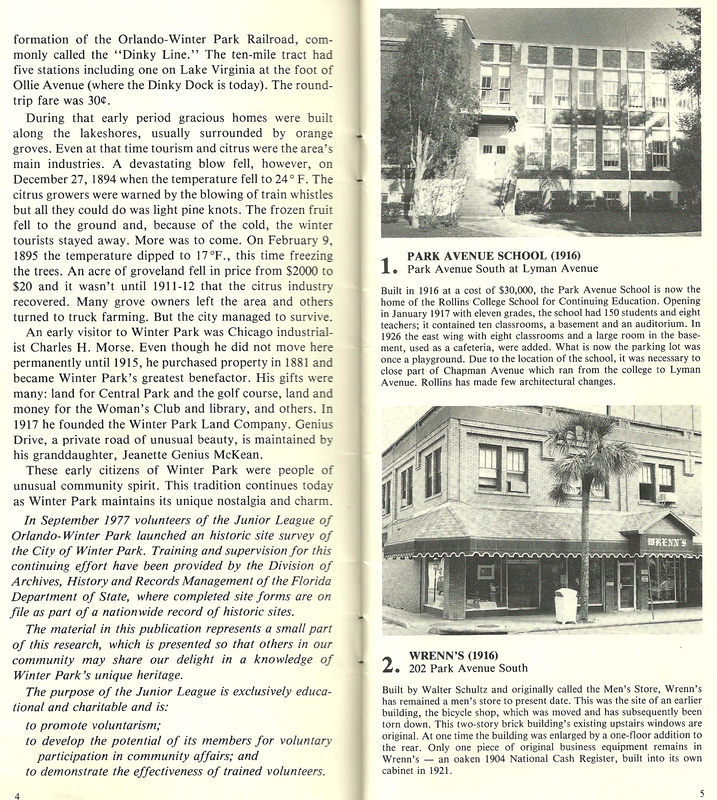 When the brick buildings that you see were built between 1912 and 1930, they were built mainly to replace rows of wooden businesses that had disappeared during the fires of 1909 and 1912. Winter Garden built their new edifices to last, and they still stand proudly– and are all occupied and put to good use. They stand next to the 1927 Edgewater Hotel, the 1934 Garden Theatre, and so much more. Winter Garden couldn’t afford to tear everything down and build spanking new modern edifices in the 70s and 80s like so many other towns. 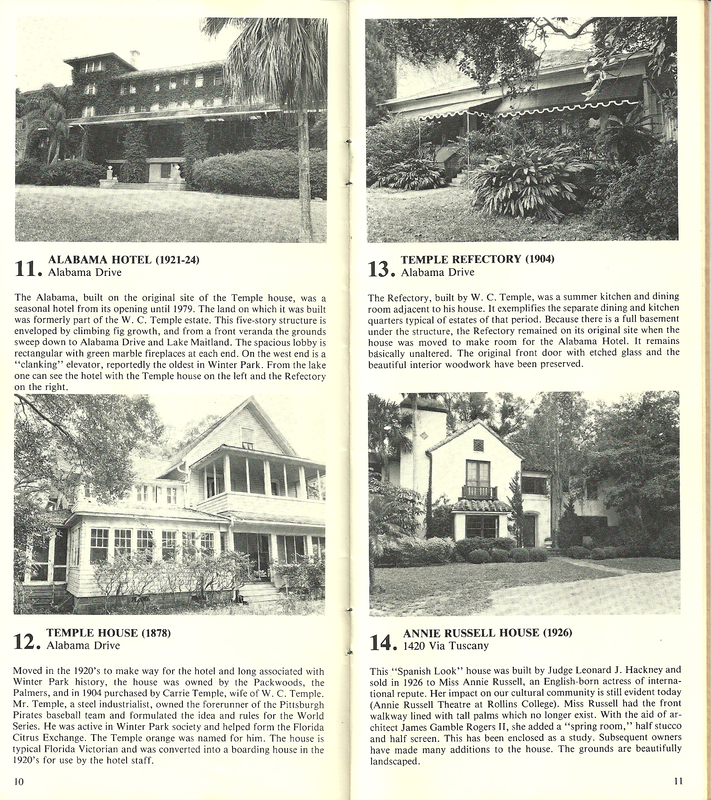 The pollution of Lake Apopka, the decimation of the orange industry due to freezes, the shutting down of the railroads, and the construction of highways around the little city all conspired to keep the area overwhelmingly unable to dynamite the old and build the new. 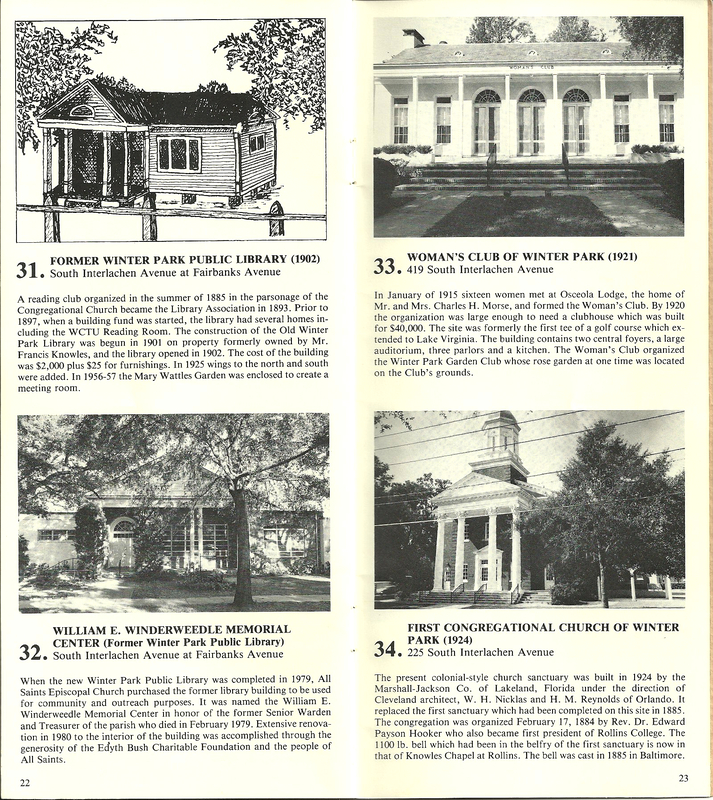 Granted, some unforgettable, iconic structures bit the dust, but early efforts by concerned townspeople led to the creation of organizations dedicated to the preservation of a world from the past; a world that continues to spin. People riding through Winter Garden, Oakland and Tildenville on the West Orange Trail are amazed at what the area looks like today. The past is palp[able in Winter Garden– it’s appreciated, nurtured, catered to, and loved. 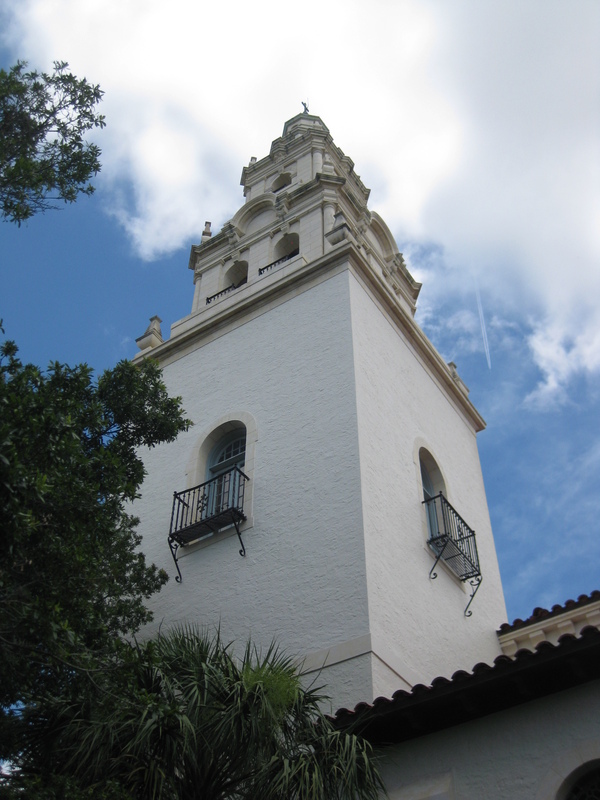 Since I work out there but live in Winter Park, I get to see the latter city often, and I’m always dismayed at what I see happening in the name of progress where I live. It makes no sense, this bulldozing of what attracted people here. Why kill the reason why you came here? 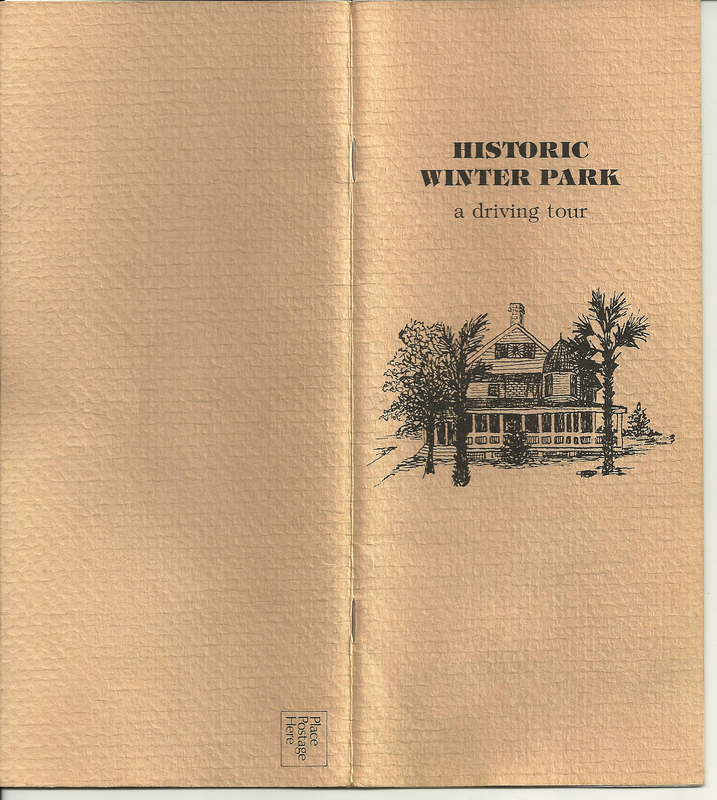 Winter Park, with all its resources, should be ashamed of itself. 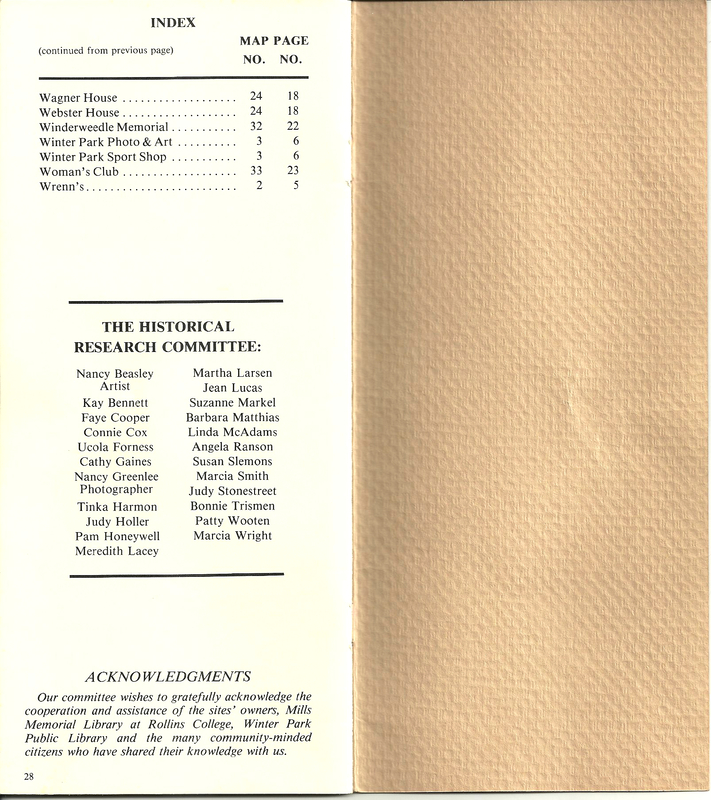 And I wonder if there’s a corner in their history museum that keeps track of what continues to disappear? I’m almost afraid to find out. 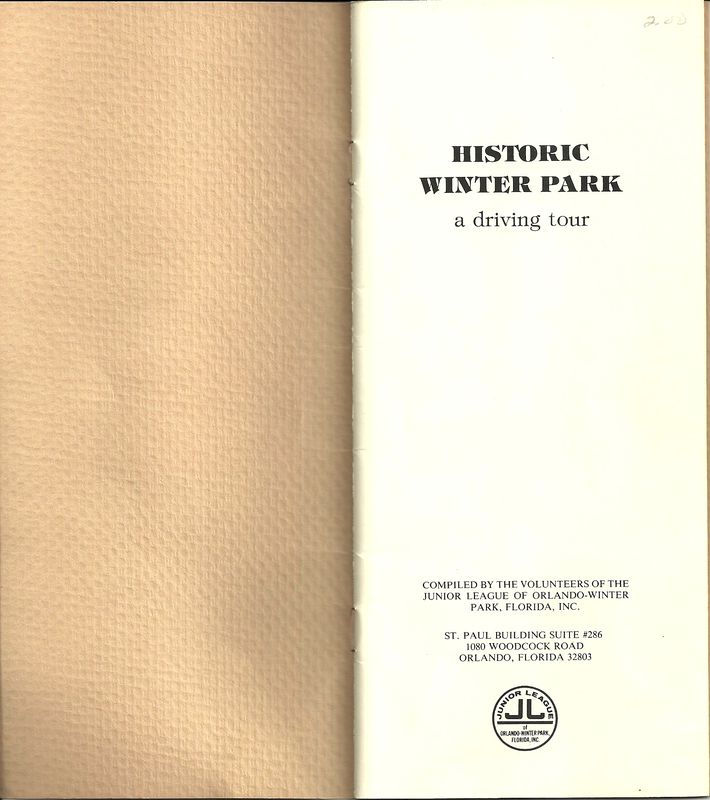 Many of the iconic old homes still stand, documented in a booklet I have called “Historic Winter Park– A Driving Tour,” published by the Junior League in 1980. I just hope this little treasure doesn’t end up becoming nothing more than a book of memories.